TEHRAN, May. 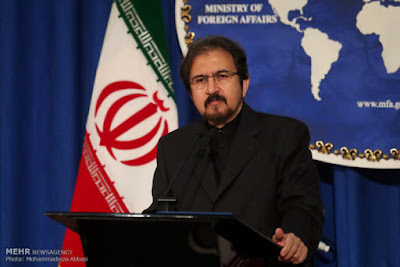 07 (MNA) – FM Spokesman Ghasemi said Mon. Iran may stand a better chance of advancing its economic policies in the face of US withdrawal from JCPOA and in absence of a nuclear deal. During his weekly presser on Monday and to Mehr News question on whether Iran would have a harder time advancing its economic policies if US withdrew from the nuclear deal, Ghasemi said, "I do not think so, because the US withdrawal could even lead to better and more positive measures taken by Iran." He went on to add, "given our plans and predictions, we may even be able to have far better results in implementing our policies regarding the resistance economy in absence of a nuclear deal." "We have called on the European sides to step up their efforts in keeping US committed to its JCPOA obligations, and take a more serious stance against the US lack of commitment," he added. Asked to comment about the May 12 deadline and what Trump's final decision would be regarding the fate of the JCPOA and sanctions waivers, Ghasemi said "one cannot tell at the moment. The JCPOA has certain features that make it difficult to withdraw from it." He stressed that if Trump decided to pull out of the deal, Iran's response would be 'painful' for the US and would cause the American side much regret. "Washington will pay a heavy price for exiting the nuclear agreement," he said. "It will make the world all the more distrustful of the US." "Iran will not be the first country to violate the JCPOA, and once the agreement ceases to be profitable to the Iranian nation, we will take the necessary decisions," he added. Asked whether he confirms Zarif's alleged meeting with former US Secretary of State John Kerry in New York recently, Ghasemi said he has no information about it and refused to make a comment; "What I do know, however, is that in his recent trip to New York, Mr. Zarif used the opportunity to hold lengthy meetings with over 30 analysts and influential figures in US including Democrats and Republicans," he added. Elsewhere, Ghasemi maintained that the recent talks between Iran and E4 in Rome aimed at reaching a political solution to Yemeni crisis and that the two sides have made no new agreement on curbing Iran's regional influence. "Our talks focused on ways to send humanitarian aid to Yemeni people," Ghasemi said in reference to a recent Iran-E4 meeting held in Rome. "We are making efforts to alleviate the suffering of the Yemeni people and are hoping that the countries responsible for the dire situation in Yemen would allow humanitarian aid to reach these downtrodden people during the holy month of Ramadan." The meeting in Rome, the second of its kind after the one held in Munich, gathered top diplomats from Iran, Britain, France, Germany and Italy around a table to discuss the developments in Yemen. The EU statement issued at the end of the meeting deemed the political talks with Iran 'constructive' and announced the next round of the talks to be held in Brussels in the near future. Asked to comment about the Israeli regime's claim on having stolen confidential documents related to Iran's nuclear case, he said "Mr. Netanyahu needs to train more to become a better showman or a magician." "The claim raised by the prime minister of the Zionist regime is a complete lie and looks more like a Hollywood movie," Ghasemi said. "Iran's nuclear program, already verified 11 times by the IAEA, is on the right track and Iran has lived up to all of its commitments until now." Elsewhere, Ghasemi voiced Iran's full support for the elections in Iraq and Lebanon, and criticized Saudi Arabia's interventions in the affairs of certain regional countries. About Morocco's move to cut diplomatic ties with Iran, Ghasemi said the decision was most probably influenced by the Israeli regime and other hostile counries. He said Morocco's move was a blatant strategic mistake, which would not be their first regrading Iran since the Islamic Revolution.